If you've studied Golden Age comics more than a bit, you've almost certainly run across the name of Vincent Fago. After working for Fleischer Studios, he headed over to Timely Comics in 1942 and did any number of funny animal books. He became the defacto Editor-in-Chief (though not officially called that) when Stan Lee went into the Army. Dr. Michael "Doc V" Vassallo has an excellent summary of Fago's early work here. But after Lee returned from World War II, Fago is all but forgotten in comics history. One might conclude that he left the field of comics altogether. In fact, he continued drawing funny animal comics through the 1950s and then worked for Golden Books in the 1960s. But what's even more rarely mentioned is that in the early 1970s, he started his own publishing firm, Pendulum Press, and began putting out comic book versions of classic literature. He scripted most of the books himself, adapting and abridging the originals as closely as possible given page limitations, and then got talented "newcomers" like Nestor Redondo to illustrate them. (His Wikipedia entry incorrectly states that he illustrated these books himself. While I don't have them all, none of the ones I do have cite his having anything to do with the artwork.) Indeed, for many of the books, he acted only as editor and got others to write the scripts. I thought his hardcover, black & white versions were short-lived and I had a great deal of difficulty first finding anything about them online. Indeed, I'm still not sure how many and which of these books were ultimately produced. But I was quite surprised, in going through my father's collection, to discover that Fago had evidently re-published the books with new covers in the early 1990s as prestige format comic books... Curiously, while these books use the exact same art, there's no scripter credit in the newer version. They've also been colored (to the detriment of the series, if you asked me) but no coloring credit is noted either. Fago's own name as editor is stripped of the series, leaving only art credits. The introduction to each book, and the "Other Books In This Line" list at the end, note that there were to be 72 issues in the series. However, I can again find only the barest of information about this online, and what I can find suggests that the series was discontinued after the sixth issue. I've only got a couple versions of some of these stories in comic book form, but I'm half-tempted to seek out other iterations to see how Fago's version holds up against the others. They all certainly had great material to work with, but it'd be interesting to see how fared in a sort of head-to-head competition. But more importantly, the work that Fago (and others) did to bring great literature to a younger audience is noteworthy. And sure, the comic book versions are "dumbed down" a bit from the source material, but getting these books into the hands of kids is only guaranteed to entice them to seek out more. And I suspect that Fago's biggest hinderence to not doing that more successfully was simply one of distribution. After all, the world's greatest work is worth nothing if nobody can find it! Back to my original point: if you run across the name of Vince Fago and how he did all these wonderful funny animal books, I'd like you to take a second or two to remember that he wasn't JUST a funny animal cartoonist. He was a man who had an impact on kids, like myself, whose first introductions to prose novels were his comic books. Boy, you never know what will turn up when you start doing a "Google" search, either of websites or simple of images. 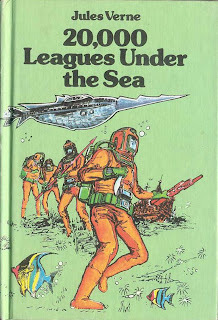 For several days, I've been trying to track down the cover of the 1973 Pendulum Press version of "20,000 LEAGUES", which was reprinted (under an UGLY-as-hell Gil Kane cover) by Marvel in 1976. I finally DID, and discovered, to my surprise, that Pendulum was headed up by none other than Vincent Fago, the guy who was MARVEL's Editor-In-Chief when Stan whatsisname was in the Army! I'm putting together the 1st of a series of blog pages on Jules Verne, and wouldn't you know, I decided to start with his MOST popular story. The project keeps growing further and further out of control, as more and MORE comics adaptations keep turning up. The question might be, HOW MANY comics versions of ANY one story does anybody really need? It's Out And It's HUGE!! !